Wherever you find four mathematicians, you’ll likely find a fifth. Like many classroom teachers, I’m often ready for a cocktail on Friday afternoons. And like those teachers, I don’t want to spend a lot of time thinking about it; I don’t want to rummage for a recipe; I just want to relax and have a drink. But, I also don’t want to have the same cocktail every Friday; variety is the spice of life. So, what’s a boy to do? I’m here to tell you, friends — it is. For instance, 2 parts tequila, 1 part lime juice, and 1 part triple sec? That’ll get you a tasty margarita. And 2 parts bourbon, 1 part lemon juice, 1 part simple syrup? None other than a classic whiskey sour. Now that you know about the other golden ratio, here’s what you need to do: Organize your liquor cabinet into two parts, hard alcohol and sweet mixers. Then, make sure you keep a couple of sour mixers in your fridge. When you get home on Friday, just grab a bottle from each side of the liquor cabinet and one more from the fridge, pour, and — voila — instant happiness. Wanna get a little crazy? Find your favorite cube-shaped random number generator, give it three rolls, then choose the appropriate item from each column in the table below. Personally, I’m hoping for 6-3-5, which is kind of like a Mezcal Paloma, sort of like a Honey and Smoke, but not really similar enough to be either one. So, I guess I get to name it. And given what I’ve heard about the fat-burning properties of honey and grapefruit juice, I’m going to call this newly minted beverage the Weight Watcher. Now we just need to come up with names for the other 215 combinations. I’ll get started on that right away… soon as I finish this drink. The conversion between Fahrenheit and Celsius temperatures follows the rule F = 9/5 C + 32. Sometimes, the temperature is positive for both Celsius and Fahrenheit; sometimes, the temperature is negative for both Celsius and Fahrenheit; and other times, Fahrenheit is positive while Celsius is negative. What is the least possible product of the Fahrenheit temperature and its corresponding Celsius temperature? You can pause here if you’d like to solve this before I present a spoiler. When will the product CF be positive and when will it be negative? When are C and F both positive, when are they both negative, and when do they have different signs? So, to the problem that I posed. 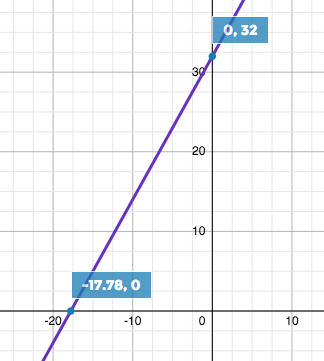 As I thought about it on the plane, I concluded that if F = 1.8C + 32, then the product CF = 1.8C2 + 32C. 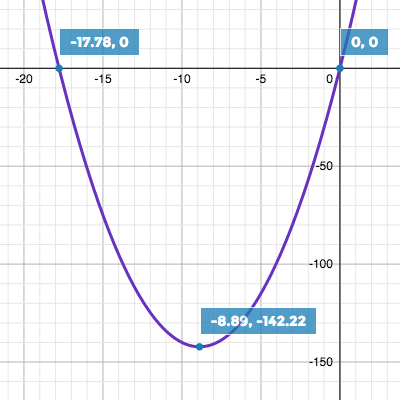 I then used calculus, found the derivative (CF)’ = 3.6C + 32, set that equal to 0, and concluded that C = ‑8.89, approximately. The corresponding Fahrenheit temperature is F = 16, so the minimum product is roughly ‑142.22. The only real benefit to using this alternate version of the rule is that it provides a reasonable check. Since both methods — and both graphs — yield an answer of ‑142.22, we can feel confident in the result. But there’s an easier way to solve this one. 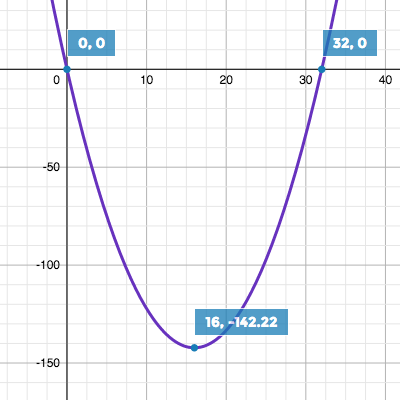 Eli hasn’t taken calculus, so he doesn’t know — or, at least, he hasn’t learned — that the minimum product should occur halfway between the x– and y‑intercepts of the linear graph. Yet, he had an intuitive insight that just happens to be true. As a result, what took me about five minutes of deriving and manipulating took him about five seconds. The second problem arose at the grocery store. 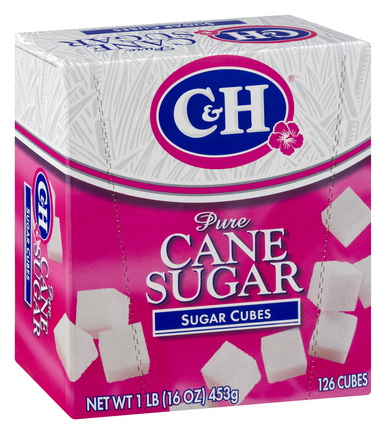 Among our purchases was a box of sugar cubes, which contained, surprisingly, 126 cubes. This number is surprising in the sense that it’s not a number you’ll see very often, except for an occasional appearance in the ninth row of Pascal’s Triangle, or maybe if you’re a chemist searching for stable atoms. A rectangular prism with integer dimensions has a volume of 126 cubic units. What is the least possible surface area? Imagine that the arrangement of cubes is removed from the box intact, and all six faces of the prism are painted red. Then one of the sugar cubes is selected at random and rolled. What is the probability that the top face of the rolled cube will be red? Wow! That seems like a lot of work to get to the answer. Surely there’s an easier way, right? Notice that the penultimate step yielded the fraction 162/576. The numerator, 162, may look familiar. It’s the answer to the question that wasn’t asked above, the one about the least possible surface area of the prism. That’s no coincidence. In total, there will be 162 faces painted red. And there are 6 × 126 = 576 total faces on all of the sugar cubes (that is, six faces on each cube). This again suggests that the probability of rolling a red face is 162/576. Did you happen to notice that the volume and surface area use the same digits in a different order? Cool. So there you have it, two problems, each with two solutions, one easy and one hard. Or as mathematicians might say, one elegant and one common. It’s typical for problems, especially problems worth solving, to have more than one solution strategy. What’s the trick to finding the elegant solution? Sadly, no such trick exists. Becoming a better problem solver is just like everything else in life; your skills improve with practice and experience. It’s akin to Peter Sagal’s advice in The Incomplete Book of Running, where he says, “You want to be a writer? […] Just sit down and write. The more you write, the better a writer you will become. You want to be a runner? Run when you can and where you can. Increase your mileage gradually, and your body will respond and you’ll find yourself running farther and faster than you ever thought possible.” You want to be a problem solver? Then spend your time solving problems. That’s the only way to increase the likelihood that you’ll occasionally stumble on an easy, elegant solution. And every once in a while, you may even solve a problem faster than your kids.